This makes me wonder sometimes: why is the city in the business of paving and maintaining three lanes of street when only one of them is actually moving cars? In fact, many people in my neighborhood have a driveway or a garage (and zoning requires on-site parking for any new construction) but they still choose to park in the street, presumably so they can use their garage for something else. Next obvious question: Why should local zoning require on-site parking when hardly any one is using their on-site parking for parking? Third, and perhaps most interesting question: If we think on-site parking has better uses than parking, could we elect to use our street parking for better uses as well? Think about it. Most of us in single family neighborhoods have a proprietary relationship with the street parking spot in front of their house. We think: “someone is parked in MY spot.” This is understandable on a logical level when there is a foot of snow outside and someone has shoveled out a spot, but it’s much less understandable when it’s just part of the city right-of-way. Given that people do have this relationship with the parking spot in front of their house, what if we enabled them to do something other than park there? 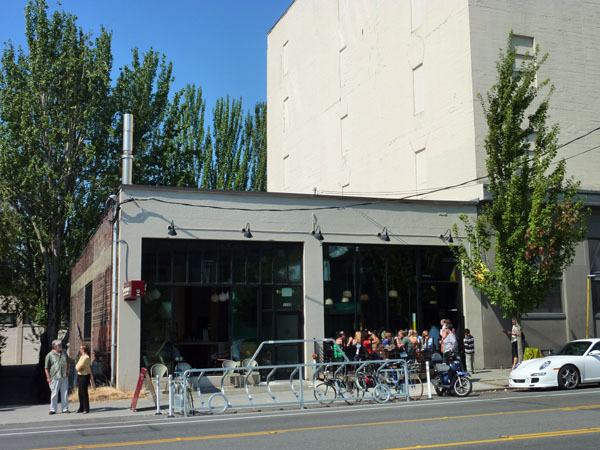 Some compact neighborhoods have taken to putting bike corrals or patios in parking spots, provided a reasonable percentage of the neighbors agree. But what if we could do this, and more, in single family neighborhoods?The transformation of street parking in single family neighborhoods could make even more sense since there is more often room to spare in those parking lanes. Not to mention that if you have zero, or even one car per household, you’re not really allowed to do anything else with that space, so you’re losing out relative to your multi-car neighbors, which isn’t really fair. What if cities allowed residential blocks to apply to convert those parking lanes to whatever they wanted to, including cottages, bike lanes, extra garden space, public p-patches or dedicated car-share parking? Even better, what if our cash-strapped cities started monetizing the value in those two lanes and allowing neighborhoods to do whatever they wanted (including parking there) as long as they rented out the space, and generally agreed on a plan? The drive lanes in the middle of the street would be conserved, we might find ourselves with more neighborhood parks, or perhaps more little cottages permeating the urban fabric. 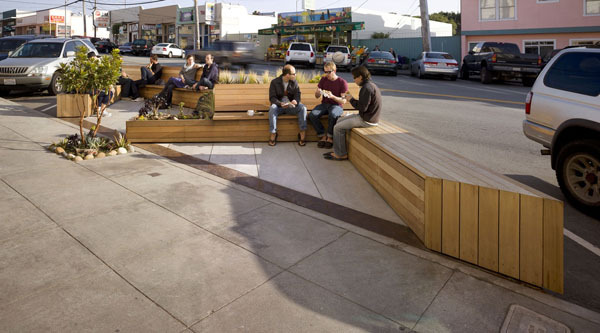 We might even find new neighborhood amenities in these spaces that we hadn’t even thought of. People are ingenious. 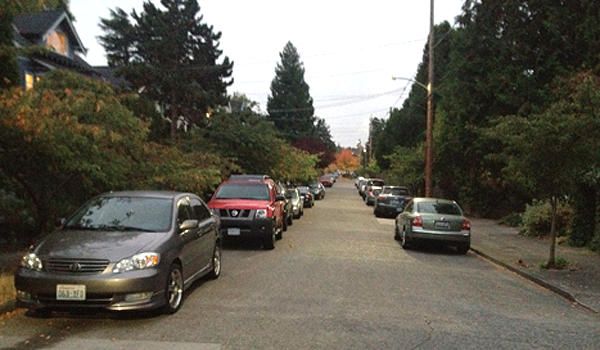 There is wasted space in the “parking” lanes of our single family neighborhoods. Let’s build some frameworks that open up these spaces to human ingenuity, and see if we can’t get more value out of them. A-P Hurd is a developer at Touchstone in Seattle and is a Runstad Fellow in the College of Built Environments at the University of Washington. She is the author of a recent book of practical strategies to get to better cities and stronger economies using less energy: The Carbon Efficient City, recently published by University of Washington Press. This post originally appeared on the Atlantic Cities. Is there any legal support at all for the relationship we have with “our” spaces near our homes? I have a garage, no street frontage, and no car to park. But I must admit being tempted to find ways to hack the system. I presume it’d be illegal to just put up planters and a bench. But wouldn’t it be legal to buy one of the billboard trucks that sometimes drive around downtown and park it like any other vehicle? I believe it would. Except you have to move it every three days. Which wouldn’t be that tough. Great idea, A-P. Another positive effect of this would be that not only might the parking lane space itself be activated and enlivened, but also the adjacent “parking strip”. One of the great detriments of cars as physical objects is that they not only tend to wreck the spaces they occupy and pass through, but also all the space that is just next to them. Parking strips, medians, all that “surplus” space that is deemed largely expendable because of the cult of the car. Making better use of the on-street parking lane would enable better use of the sad, grassy parking strip stuck between the sidewalk and street, freeing that space from the necessity of accommodating swinging car-doors. on my street in Portland, the parked cars do a good job of making our street effectively one-way, forcing cars to drive slowly and wait for on-coming cars. That lane is pretty well used for hockey, basketball, throwing balls for dogs, trike path, bike jumping, beer drinking, and hula hooping. I believe that neighborhoods should immediately start using their entire streets in ways that serve the neighborhoods. These are public spaces intended to serve as local connectors, and should be modulated block by block. I would like to see some mechanisms for people to legally close or partially close streets on per block, temporary and short-term basis with neighbor buy-in. However, I do think that semi- privatizing this space is a mistake. Look at community gardens: when these are installed in park, they effectively eclude any other uses, and they are hard to get rid of! The same could be said for basketball or tennis courts, but when a game is not being played, they are flexible and public enough for other uses (trike riding, bike polo, etc). Little cottages and private gardens would not be an improvement over the way our street is used as an informal, temporary park, with neighbors working together to organize or remove parked cars and control through traffic. My neighborhood has streets as described here as well as alleys. Having both seems quite wasteful. I think that you were right on with this article. You put a nice twist to it. Great job A-P.